The "Dual Band" Yacht Controller, after 12 years of evolution, has provided the basis for our new Wireless Joystick remote “Fusion”. These systems simultaneously transmit on two frequencies thereby eliminating the possibility of signal interruption due to unauthorized use of radio frequency bands by others or government agencies. The security of our system with its 5 microprocessors and 10 relays ensures a command reliability greater than the actual wired controls to the ships on-board microprocessor, yet this plug and play system is easy to install and extremely user friendly. Add to that, a waterproof transmitter which floats and a waterproof receiver and you have durability virtually unmatched by most electronic equipment in the field. "Dual Band" functionality provides a connection confirmation which silences an acoustical alarm thereby confirming the transmission/reception between the transmitter and receiver, and also a take command button to make the "Dual Band or Fusion" transmitter the active station. In the very unlikely event of loss of connection, the alarm will signal. The Yacht Controller system will always remain in neutral unless the Porsche designed silicone levers or the joystick are pressed, thereby eliminating any danger of unwanted command. If the system is idle for 4 minutes it automatically turns off. With almost 17,000 Yacht Controllers in the field our technology is well proven, secure, reliable, and precise. "Dual Band" Yacht Controller technology represents the conquest of a new frontier in Yacht Control which has greatly benefited the marine industry and our customers by making it safer and easier for them to operate their boats and to consider the purchase of larger ones. Operators by attaining the ability to both maneuver their boat into a slip AND TIE IT UP WHILE CONTROLLING IT WIRELESSLY provides a method far greater than any other engine and drive combinations while docking. Other systems only focus on getting the boat into a slip without offering any method to assist in the tie up, other than to stay at the helm or run for the lines. These other systems at best do only half the job at great expense, while Yacht Controller’s “Dual Band" and “Fusion” offer an extremely cost effective and practical solution to the complete docking and tying up process. 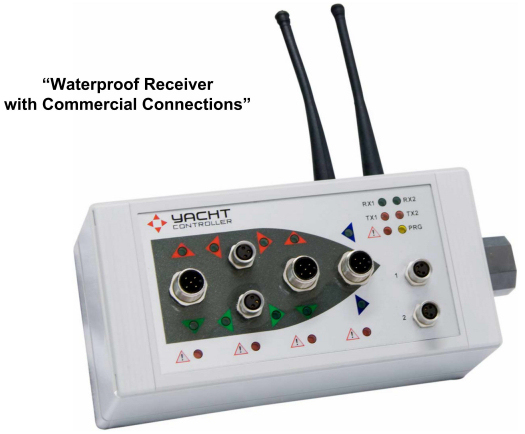 Yacht Controller system technical highlights include the following: waterproof (both transmitter and receiver) with watertight connections and corresponding gaskets. “Dual Band” is equipped with proprietary silicone membrane switches developed by Porsche Design. “Fusion” is a complete Joystick system providing computer driven proportionate control of engines and thrusters in a combination to satisfy the position of the joystick as selected by the operator. Unique control heads, functions and thrusters are enabled by inserting card chip processors in slots so systems can be moved from yacht to yacht should the owner change vessels. Individual microprocessors for each function employ back-up relays to ensure redundancy for safety and security working via CANBUS system. Acoustical alarm and take command functions replicate original control functions also for safety and security. Automatic shut off after 4 minutes of non use, constant visual signal for transmission, low battery alarm and acoustical alarm in event of loss of signal all provide additional safety. As a veteran of the marine industry for many years, holder of a 100 ton captain's license and designer and seller of many yachts I can uncategorically state that Yacht Controller is one of the most welcomed and enjoyed products in the Marine Industry. With more than 10,000 systems in the field, and total customer satisfaction, "Dual Band" and now "Fusion" are breaking all barriers in Yacht Control for 2015 and beyond.